"In essence, what we found is that the disk of the Milky Way isn't just a disk of stars in a flat plane—it's corrugated," said Heidi Newberg, professor of physics, applied physics, and astronomy in the Rensselaer School of Science. "As it radiates outward from the sun, we see at least four ripples in the disk of the Milky Way. While we can only look at part of the galaxy with this data, we assume that this pattern is going to be found throughout the disk." "It's very similar to what would happen if you throw a pebble into still water - the waves will radiate out from the point of impact," said Newberg. "If a dwarf galaxy goes through the disk, it would gravitationally pull the disk up as it comes in, and pull the disk down as it goes through, and this will set up a wave pattern that propagates outward. If you view this in the context of other research that's emerged in the past two to three years, you start to see a picture is forming." wow, I actually thought we were a little bit further out from the center. . . Somehow, I never assumed the Milky Way was a flat disk - seemed reasonable that it was "textured" in some manner and this research bears that out. 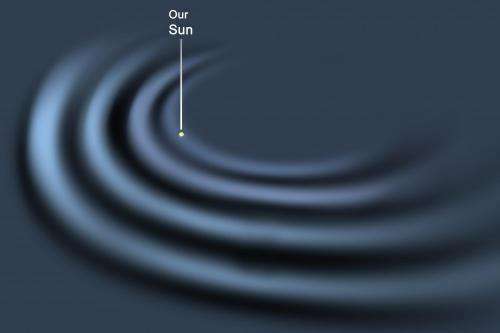 Too bad we can't send out a probe perpendicular to the plane of our galaxy and go far enough out to view it at an angle that would allow visualization of the "ripples". Well now. I wonder what we'll discover next . . . This is a perfect example of why it is usually foolish to draw conclusions from any data, as that data is always subject to change. Well now, your self there Skippy. This is a perfect example of why we aren't still waiting for a lightening bolt to start a brush fire so we can cook dinner. Cool! I always wanted to live in a major galaxy rather than some rural space backwater. It's another indicia, that the Milky Way experienced galactic merger in distant past. The speed and inconsistent composition of stars around Sun and the oscillating path of solar system along galactic plane indicates, that the Sun originated from foreign galaxy. The ripples around galaxy should be correlated with relative motion of Milky Way - maybe it's AdS/CFT dual analogy of so-called pilot wave of quantum mechanics. Other reasons might exist for the ripples, other than a dwarf galaxy or dark matter lump passing through it. Some galaxies are globular, others are elliptical, still others are just plain asymmetrical. The Milky Way is a symmetrical barred spiral galaxy and this lends some doubt as to the origins of this phenomenon. This points to the nature of star formation, motion of the whole, and its spin around the galactic center. The ripple effect is analogous to a loosely coiled hose, with the concentration of stars in the arms leading to this observation. Dwarf galaxies and DM lumps (?) passing through it would result in a far more chaotic and vastly different shape, IMO. This is not the first "discovery" where it is finaly start to realise that in 3 dimensional space there is a 3th dimension not just 2d flat stuff. . . . . . If our galaxy is 100K, to 150K light years in diameter, I wonder how many light years thick is it. WOW! All of this in only 6,000 years! "It's very similar to what would happen if you throw a pebble into still water - the waves will radiate out from the point of impact," said Newberg. "If a dwarf galaxy goes through the disk, it would gravitationally pull the disk up as it comes in, and pull the disk down as it goes through, and this will set up a wave pattern that propagates outward. I find it kinda sad, but amusing at the same time, that they always seem to assume a "bullseye" collision, when, as everyone in the whole world knows, the odds against are --literally-- astronomical. Further --to rely upon this unlikeliest of causatives to explain this "rippled disc" is pure folly. 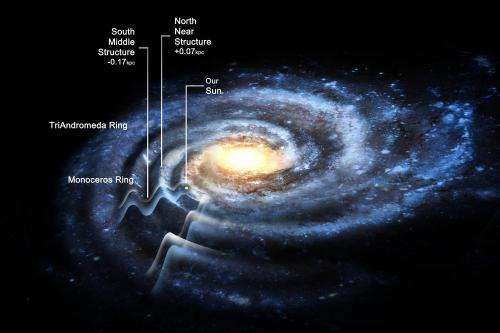 Like most of you, I've always visualized the spiral arms as being big, winding pipes of stars'n'dust, with matter density greatest towards their horizontal axes --which are, in effect-- the centers of mass/gravity with respect to the spiral arm. Uh, am I mistaken in thinking those steep 'ripples' mean there's a lot more mass out there than if our galaxy was as flat as earlier models suggested ?? I'm quite shocked at my long term misunderstanding, but even more shocked that anyone ever conceived of the galactic disk as being of roughly homogenous thickness, like some kind of platter. And, again, relying upon some supposed bullseye collision to impart the so-called oscillation of the arms above and below the plane of the galaxy also seems like quite a stretch to me --if pressed, I would guess that this observation would prolly be better explained as being relict evidence of the milky way's gravitational collapse from a more-or-less spherical mass of gas'n'dust to it's current accretion disk/spiral outgrown from that gravitational collapse. There is no reason to believe that the process would have been completely uniform, and it seems natural enough --at least to me-- that some of the arms would wind in from above- and some from below- the galactic plane. I think most science articles should probably end after "this is what we found" and just eliminate "this is what we think it means". We can, sort of. Send an observatory to 500 AU. Use Sol as a gravitational lens. Many things will be revealed. If we dont draw conclusions from data like you say, never. In fact we'd have never discovered anything. How is science supposed to work to you? As the article said, this isn't the first time there has been observations of ripples and disk tilt, and models with dwarf galaxy collisions predict the seen features well. I'm not sure how people tend to to think the ripples will be symmetric with the collisions. Even off-centric collisions will give a mass center oriented ripple, like in a drum skin. Here it is the balance between gravitation, rotational momentum and the friction processes that has made the disk collapse in the first place. The null scenario of no collision is a perfectly flat disk. I am also not sure how people construe probes for visualization, since we already have it (incomplete as it is), these features are no guesses. @uD: "If our galaxy is 100K, to 150K light years in diameter, I wonder how many light years thick is it." This reminds me of the animation of two neutron stars sending gravitational waves out as they orbit each other. Could gravitational waves play a role in our galaxy structure? Could the bar in the centre of the galaxy have a role? Modified Newtonian gravity (MOND) is the observed feature of Elliptical galaxies which contain most of the stars in the universe (60-70%) & creates 99.9999% of all gravitational lensing because Ellipticals which create are so much more massive than Spiral galaxies. MOND also accounts for the slower rotation rates of Ellipticals at 2 km/s as cp to Spirals at 200 km/s. Notice in all those pictures of gravitational lensing effects? Almost all those galaxies being lensed are Spirals & the galaxies creating the lensing are Ellipticals, but never the reverse. You never see pictures of Spirals lensing Ellipticals. The reason being that the gravitational fields of Spirals are so low that they cannot create lensing. Well, originally the thinking was that ellipticals evolved into spirals but maybe it is the other way around; that spirals evolve into ellipticals. Our 'puffing up' would mean whatever was holding us flat has lost energy and the normal rules either come into effect or lose ground. And our newly discovered dwarfs, are their orbits going to be mostly circular? That's a relief, because I was feeling a bit claustrophobic. ;no mysterious DM or collisions needed. What it does suggest is there are large scale electric currents/fields that go along with the large scale galactic magnetic field. The presence of those currents/fields renders the need for DM moot. No fairy dust is needed, just the proper understanding of the EM forces acting across the many scales with which they operate. That is an interesting question and it should be possible to test it by viewing the motional behaviour of matter around the black hole. However, the bigger and more regular the tilt, the less flat our galaxy would be. Apart from that it is known that the rapid spin of black holes causes a "wobble" by itself and this could already create ripples. Though I have no idea if such wobbles can reach out that far, I wouldn't be surprised if that is the case here. jeez people -- we have known the MW has a thickness of about 2k light years. The NEW item in this article is that the thickness has a wave like distribution. That it get thicker in waves... we assumed a nebulous thickness before, that it was in general, that stars were densest along the plane and followed a an almost bell curve thinning the farther from the plane you traveled. This new insight is stating that the density follows a wave pattern up and down which is indeed new. We knew it had thickness and we knew about about the 3rd dimension, what was unknown was that there was a pattern to the thickness. you guys really don't give people with a Ph.d any type of credit on here. Ellipticals of the size that cause gravitational lensing would of necessity need to devolve in size (lose mass) if they were to become Spirals, this because the largest Spirals are all way smaller than the more massive Ellipticals of the size that cause lensing. Maybe smaller Ellipticals could form into Spirals but for massive Ellipticals to do this would require huge losses of mass (stars). Many Ellipticals are more than 50 times the mass of our MW, so how you go about busting up something that big to create 50 Spirals the size of the MW would require some real fireworks. It would seem only a collision with another Elliptical could provide the energy to create that manner of fireworks. Maybe someone posting here can link us to observations of colliding Ellipticals, but I'm unable to find any. Cont'd from previous: Found a link to colliding giant Ellipticals discussing how rare an event such collisions are. I think that the term "ripples" is a misnomer. How can we be sure this is not just a manifestation of 'Andromeda envy'? @jediknight190501 demonstrates the purist form of goddamned sophistry. So, you would collect data and not use it? Not collect data? WTF are you trying to even say? Nothing. You just love the sound of your own voice. A number of parents on here need to have read the study about effusive praise causing narcissism. All these, "We'll I've never amounted to anything but a POS, but I've always thought...". Why would we care? Humans are the only vermin that cop an attitude. Pure sophistry is trolling, but what about the like of cantdrive85? There's your point about mental illness. CD85, do you have a job? Have you ever? Are you writing your response from your mother's house? Have you ever gotten laid? Highest grade completed wtih GPA? I think we know the answers. Yet you have DM totally sussed out, between whacking off, playing video games, and torturing animals. You don't have an understanding of the reality in front of your face. You certainly have nothing to say about the cosmos in general. So, just STF up. You keep believing in fairy dust and the associated fairy tales you're told to believe and I'll continue thinking for myself. Rather than calling people names like a 8 year old child, tell us why this observation doesn't match the already observed Heliospheric current sheet in our solar system. The laws of plasma physics shows these processes are scalable, why do you choose to plant you head in the sand? To test the origin of ripples from external perturbations run the film backwards. If the ripples diminished from running the film backwards, the time where this occurs can highlight 'suspects' in the vicinity of the Milky Way that were there at that time. "the film backwards" simply means a computer model (simulation) to test the initial and final parameters. Phillip and Alexander's Macedonia was just a backwater suburb. As for the stone rippling a pond. Is the 'stone impacting' at a 90 degree angle or skipping like the childhood memory? Rather than calling people names like a 8 year old child, tell us why this observation doesn't match the already observed Heliospheric current sheet in our solar system. The laws of plasma physics shows these processes are scalable, why do you choose to plant you head in the sand? Scalable? So you're claiming the galaxy is composed of a monstrous central star and nothing else besides some giant planets, comets, and asteroids? Need your added critic to the rating you gave me. Thanks. 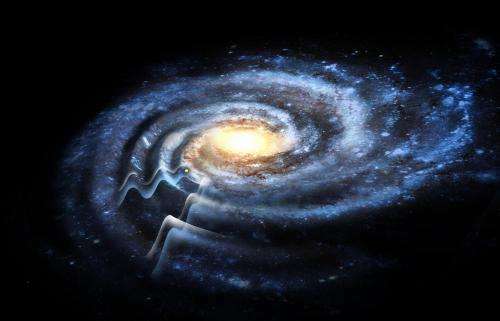 The ripples around galaxy should be correlated with relative motion of Milky Way - maybe it's AdS/CFT dual analogy of so-called pilot wave of quantum mechanics. I'm always impressed with reliability, in which the most insightful comments are getting downvoted with PO trolls. The stupid people must have some radar for hating and dismissing of intelligence. But the quantum wave character of dark matter has been developed recently and maybe we are just facing first observable evidence of it. In addition, there is a concept called AdS/CFT correspondence. The mainstream physics of latest forty years didn't really achieve great success in deeper understanding of reality - most of proposals of modern theories like the stringy, susy and loopy models failed the experimental scrutiny. But one of concepts really deserves a deeper attention - it's a holographic principle of AdS/CFT correspondence, which essentially says, that the phenomena at the quantum scale will mirror itself at the relativistic scales. The AdS/CFT is a theorem of five-dimensional holographic model, which gets broken heavily with another dimensions at the human observer scale, so it cannot be observed. But at the distance scale of 4D general relativity the subtle dark matter effect represent five-dimensional violation of it, and some aspects of AdS/CFT duality can be observed. IMO one of them is just the pilot wave character of dark matter around galaxies. The voting PO trolls usually support the mainstream science non-critically, because they're ignorant and stupid. But the same stupidity leads them into dismissal of comments, which actually support the rational core of mainstream physics - because they just don't understand it. The idiots are disaster of science in any form, they can only parrote the insights, which they remember as valid - which is nothing very much, because they've memory of tropical fish. I'm always impressed with reliability, in which the most insightful comments are getting downvoted with PO trolls. The stupid people must have some radar for hating and dismissing of intelligence. But the quantum wave character of dark matter http://www.scienc...2358.htm and maybe we are just facing first observable evidence of it. Sometimes your comments have merit, and sometimes not. However, one thing is for sure --you aren't going to win any converts to your views by quoting yourself, and any time you do --then you should expect to be downvoted, for reasons which should be obvious. The fully Socratic discussion should be background independent like the spreading of information inside of Universe - the name of persons engaged in it shouldn't matter at all. You should therefore detach your attitude from persons and focus to the subject. This is what actually matters in matter of fact discussion. Note that I'm replying to quotes cited, never the @names. If we would discuss anonymously, it would certainly help the objective character of discussion. is this indirect evidence of dark matter/energy ? IMO these waves don't require medium, until they're driven with particles acting at distance. If the particles in intergalactic gas are repulsive and inertial, they do act like elastic springs by itself. The another question is, what the "action at distance" means and whether it doesn't require the medium on background (like the magnetism) by itself. In aether or Maxwell model the magnetism is result of turbulence of vacuum in extradimensions. I.e. sorta analogy of the force, in which they're interacting vortices at the water surface via motion of underwater. It's hard to say in a given moment. It could be evidence of dark matter, if we would prove, no electrostatic or another classical forces are involved. If we should believe the above picture, then this wave looks like the pilot wave of quantum mechanics, so it could be a dark matter effect. But the question is, what this picture has to do with reality. We know about many sonic waves in interstellar gas, which are result of supernovae explosions. If central area of Milky way exploded in distant past, it would also leave some ripples across whole galaxy. IMO we should correlate the orientation of these ripples with direction of motion of Milky Way toward another galaxies or CMBR Doppler anisotropy for to get a better clue about nature of this effect. BTW There can be another source of waves - the collision of some dwarf galaxy (which are encircling the Milky Way like the satellites) with the galactic plane. The reason why I'm rather skeptical regarding the dark matter wave interpretation is, we did never observe it at another galaxies, where it should be detectable easily, because we are observing them from outside. Why just Milky Way should exhibit some ripples? Zephir - no matter how anonymous you try to be, you end up saying something idiotic about AWT or cold fusion or global warming due to galactic mid-plane neutrinos and thereby betray your identity. Objective discussions cannot be held with parrots.